Twenty-six JJA Jazz Heroes were also named. Many 2013 JJA Jazz Award winners named above will receive the Award at one of his or her upcoming performances. 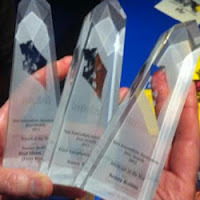 If you are a winner, please write Howard Mandel president@jazzjournalists.org to schedule a public Award presentation. Award winners in the journalism and media categories will be were named at a June 19 party at the Blue Note Jazz Club in New York City. Ticket information will be posted on this site soon. They are also listed above. You can help the Jazz Journalists Association continue to get the word out about jazz through programs like JazzApril and the JJA Jazz Awards. Please make a donation --contributions of any size, no matter how small, are gratefully accepted. Or become a JJA Member. Membership is open to jazz musicians, educators, presenters, promoters, publishers or anyone who wants to support our work as well as professional jazz journalists. Thanks.